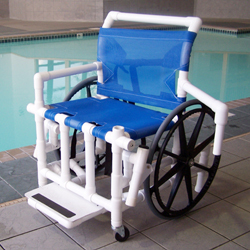 Pool Access Chair with Mest Seat, PVC construction, anti-tip design, and swing-out armrest. F-520SPM: Pool Access Chair, 18″ w/mesh seat, 250 lb. F-520XWSPM: Pool Access Chair, Heavy Duty, 24″ w/mesh seat, 400 lb.